Chances are you’ve never heard of this game before. However chances are you will recognize the main character who is the Mascot for the company Asmik. Now if you never heard of the company Asmik but you have played their games. Does Wurm, Conquest of the Crystal Palace, Megalit and D-force ring a bell? Some of the games that Asmik made were also published by other companies and brought stateside. Like WCW/NOW world Tour, its sequel WCW/NWO Revenge and finally Wrestlemania 2000. However let’s move on to today’s gem. 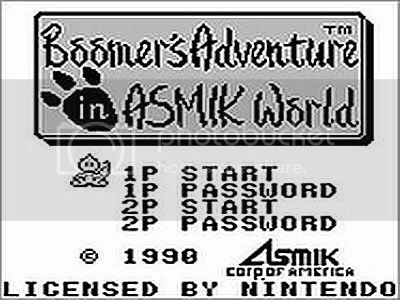 Boomer’s Adventure in Asmik World probably has the longest name for a Gameboy game. It’s also a true lost gem and it makes me all giddy to finally spread the word on this game. Boomer’s Adventure is a puzzle adventure game in the same style of Adventure’s Of Lolo, Solomon’s Key and Kickle Cubicle. Boomer’s Adventure combines elements of treasure digging and action game play to make a very intense and tough to beat puzzle game. The game and story of Boomer’s Adventure take place in a tower that you must scale. The story goes that Zoozoon has been terrorizing the land of Asmik and has turned it into a world of despair. So it is up to Boomer to end the evil lord’s reign by ascending the 33 levels of Zoozoon’s tower. As Boomer ascends, he will be met with many great challenges and dangers. 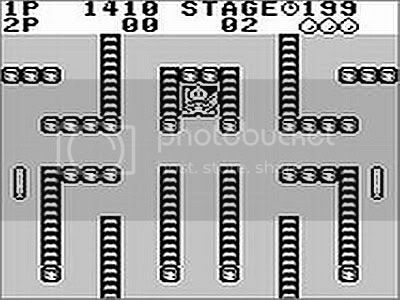 The game play Boomer’s Advenutres mostly consists of digging around each floor in search of a level key. While digging around you have to worry about a few things. The most notable thing to worry about is the time limit. 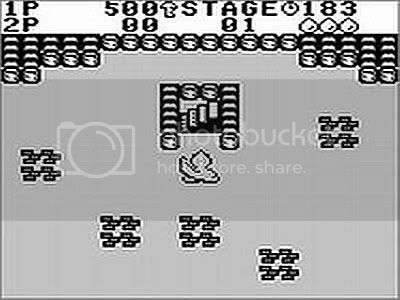 Each stage has a set time limit that slowly degrades, however you can regain a limited amount of time back by digging around for an hour glass. Other obstacles include lots of enemies that populate each floor and boss battles. The enemies you encounter vary from dogs, worms, birds, ants, slimes and crabs. Each enemy has their own speed and unique abilities that hinder you search for each floor’s key. And if that isn’t enough each monster has the ability to dig up the key and move it to another location on the floor, thus hindering your progress. In order to fight off these evil doers of nature, you have the ability to dig up weapons and other enhancements. Some of the more frequent weapons you find are bones but other more powerful stuff are buried in specific locations. Boss battles aren’t that much different than enemy encounters with only minor differences. They’re bigger, faster, and take a lot of bones to kill. Thankfully you’ll be able to dig skates to speed your movement and shovels to increase your digging speed. There are a grand total of 5 bosses as you scale up the tower and once you defeat Zoozoon then the real fun begins. Confused? I was hoping you would be. You see this is what makes Boomer’s Adventure such a timeless classic. Once you beaten the game, you now have to descend down the tower to escape. That’s right; you must continue to dig to find those keys to exit the tower, all the while continuing to fight the same monsters as before and fighting four bosses. And once all that is completed then you will be treated to the game’s true ending. 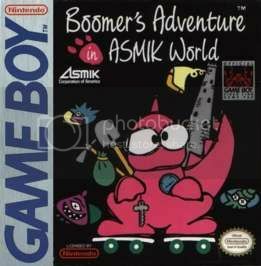 As a lost gem, Boomer’s Adventure is truly the one game that never got any notice. Even as I wrote this, I learned that there was a sequel that was released for the original Gameboy in Japan. However all I could find was just a single screenshot of the game. And because of the lack of interest in the first adventure Asmik never saw fit to bring over the sequel. I always wanted this as a child then today I sa it for 6 bucks at EB games, needless to say I snatched it up. Enjoyed the blog about psp battery found it very informative. I found a good website which also features psp battery and psp battery. The link is great for **uk bargains** including Nintendo Wii, PS2, PS3, games consoles and features famous online stores inc Argos, Marks and Spencer, Empire Direct, LX Direct, Tesco, Next. There is also a chance to play online bingo and try your luck at the online gambling sites available inc roulette, poker and fruit machines. I've also found another site for **free soccer links**. Hope you find these sites interesting - all the best!